Your child can practice the colors in Spanish and pronunciation with this activity. These games are from Spain and have audio, so that children can hear and learn to pronounce the sounds of Spanish. The activities are simple and have images, so you can use the color vocabulary in context. This game has moved since I wrote the post. I’ll update the link if I can find the new location. The menu screen will show the words Vamos a jugar con los colores (Let’s play with colors), and then you will hear four options: vamos a vestir a Kika, vamos a guardar cada cosa en su sitio,, vamos a pintar con los colores, and vamos a explotar globos). The audio that accompanies this screen is computer-generated, but the audio for the activities is very good. 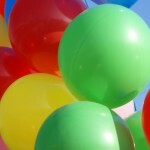 Click here to practice the colors in Spanish with Vamos a explotar globos. Here are suggestions for doing Vamos a explotar globos (let’s pop balloons) with your child. In this activity, you will hear a color and then click on that balloon to pop it. To begin, click on the balloon at the top of the menu screen. On the game screen, click on the balloon again and you will see a speaker in the lower right corner of the screen. Click on the speaker to hear the color. The written word is given, but it is important to hear the correct pronunciation. Then click on that color balloon and it will pop. As you play, use the colors you hear in sentences. You can use sentences like these. Voy a explotar el globo rojo. / I’m going to pop the red balloon. ¿Vas a explotar el globo azul? / Are you going to pop the blue balloon? Este es el globo verde. / This is the green balloon. ¡El globo azul se explotó!/ The blue balloon popped! ¡Lo hiciste! / You did it!